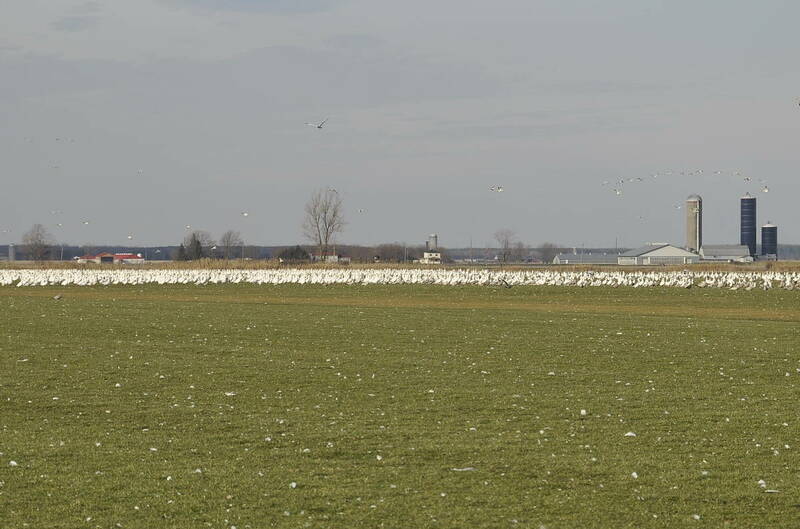 On a cool November day with sunshine in the forecast, Bob and I decided on the spur of the moment to take a drive into Eastern Ontario to see the spectacle of Greater Snow Geese amassing near Casselman. 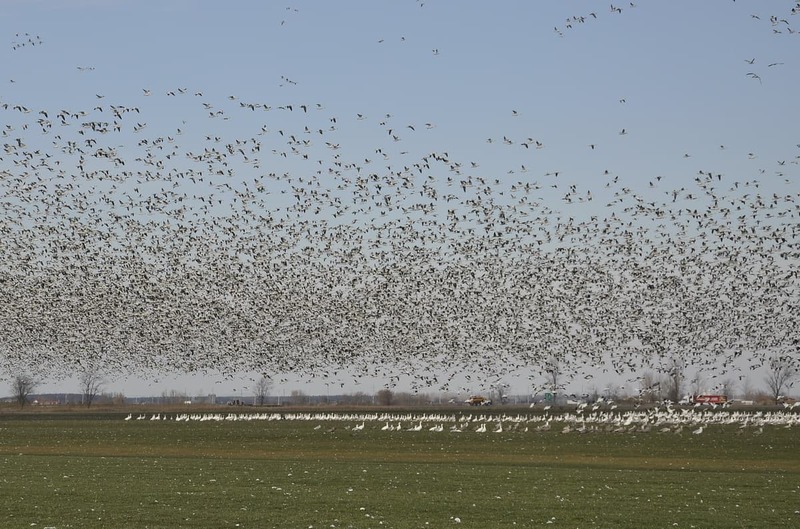 Reportedly, 60,000 Snow Geese had already formed one flock with more arriving hourly. We had good directions from a friend as to the specific area where the Greater Snow Geese were gathering, but even before we arrived there, thousands of them could be seen flying in from the north, east and west, painting the sky in fine, web-like patterns as they approached their destination. After making a left-hand turn at the designated intersection, Bob and I immediately noticed a fine white line on the far side of a vast green field. 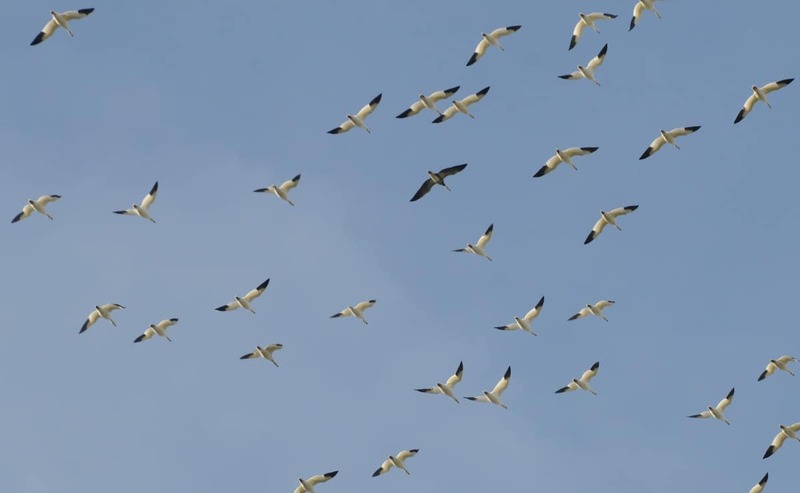 Could that be the Snow Geese, we wondered? The birds were so tiny at that distance, but the large numbers surely had to be the flock we were seeking. There was a handy spot to pull off the road, and then we grabbed the binos. 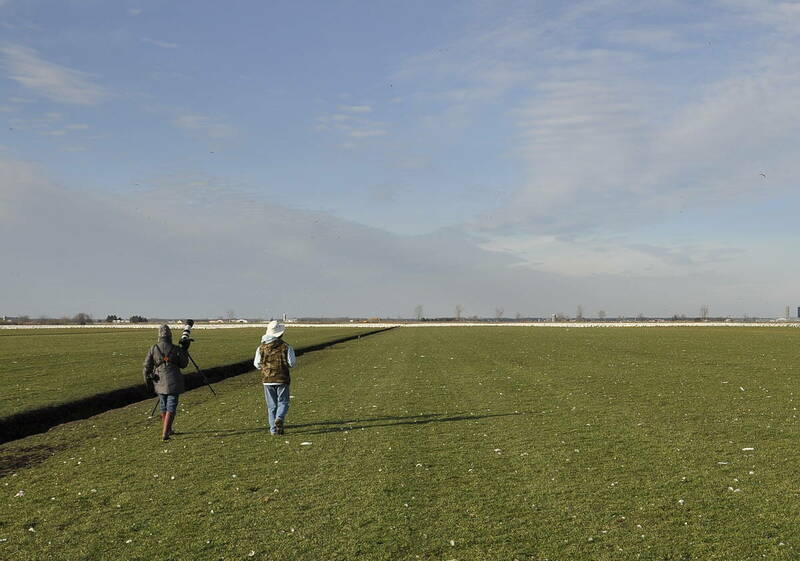 We were in luck because a fellow photographer was on hand, and she had acquired permission from the landowner to walk across the expansive field for a closer look at the Snow Geese. We exercised extreme caution as we moved across the distance. The ground was soft, wet, and slippery. A number of deep trenches presented obstacles to our progress, ditches that were filled with water. 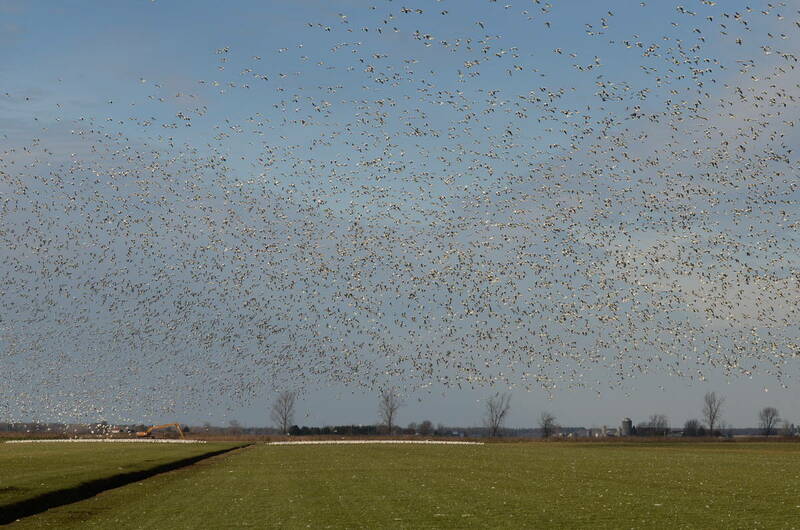 It was a heart-stopping moment when the flock of Snow Geese first took to the air. 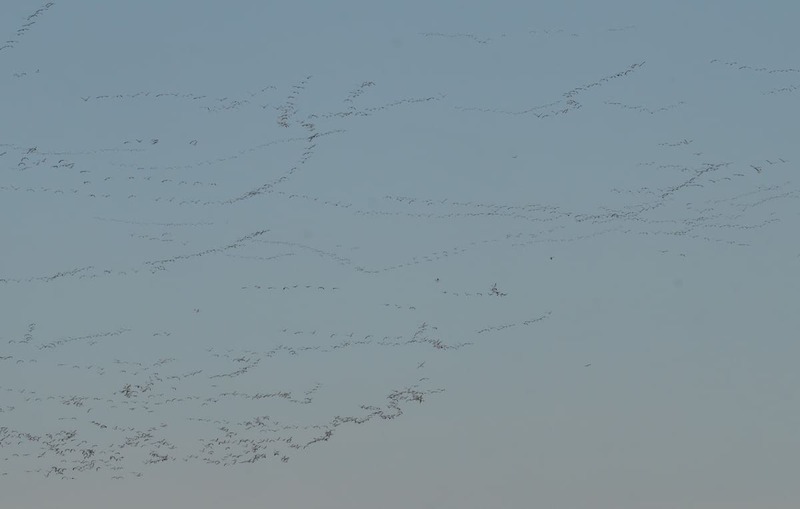 We could see no evidence of a raptor that might have spooked them, and a great distance still existed between us and the Snow Geese, so we presented no perceived threat. Our biggest fear was that the flock would move off, and our greatest hope that they would settle nearer to us. 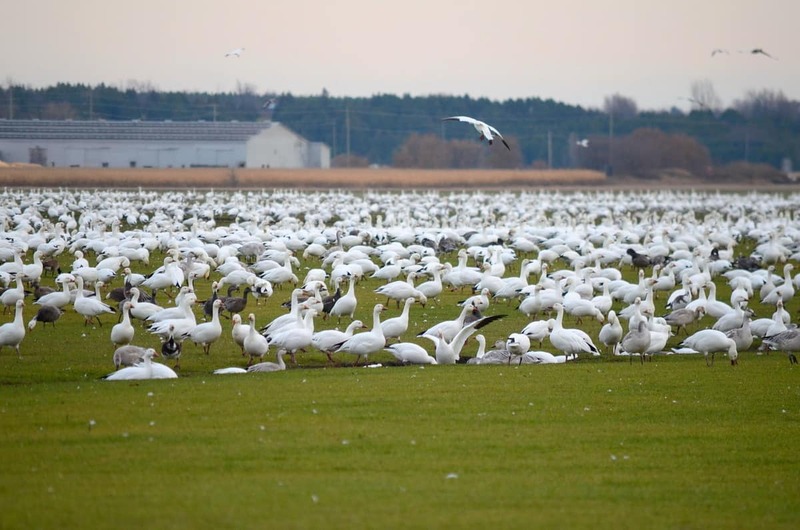 Relieved that the Snow Geese chose to land a mere few hundred feet east of their previous location, we resumed our slow and steady approach being sure to take frequent pauses to prevent alarming the birds. 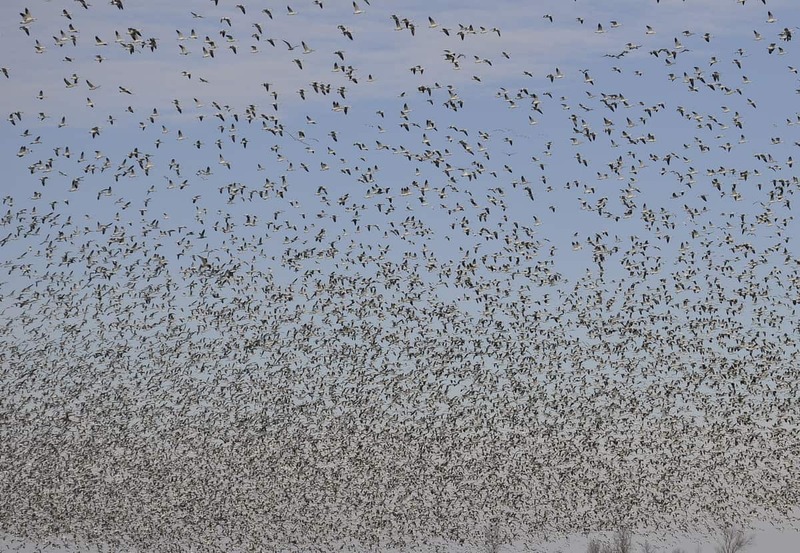 Frequently, the 60,000 Greater Snow Geese took to the air as one swooping mass. In the end, Bob and I just stood still and watched the spectacle. 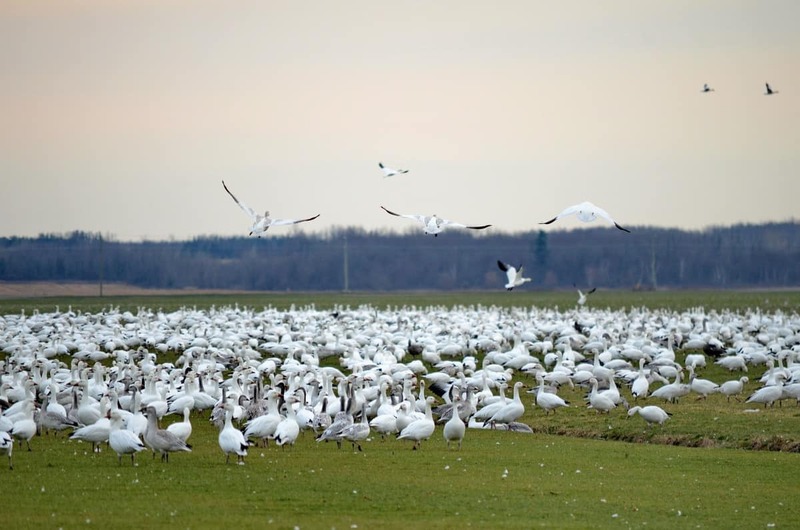 We were in awe of the fact that these Snow Geese, that breed north of the timberline in the Eastern Canadian High Arctic, find their way to the same narrow stretch of real estate in southeastern Ontario every year. Spending a few short weeks in this area is an annual occurrence for the Geese so they can refuel after having already flown a distance of 3,500 kilometres en route to warmer winter climes. 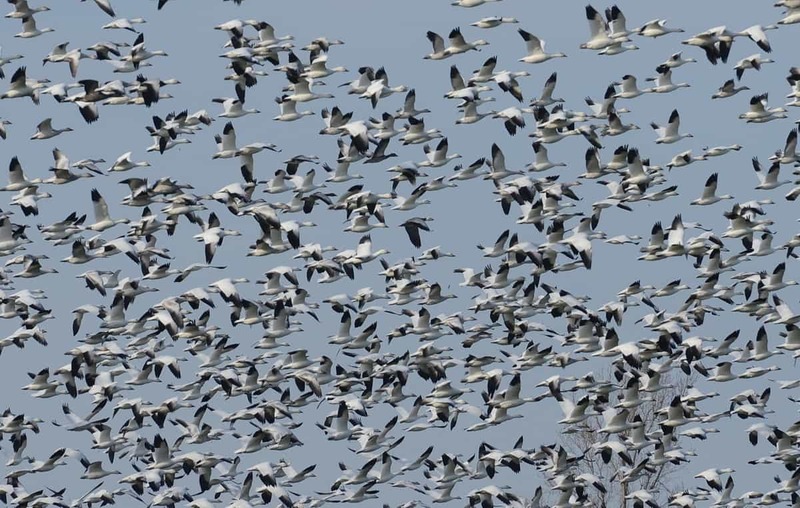 The Snow Geese begin their departure from the Arctic near the end of August and follow a relatively specific route south, a time-tested flyway that provides the necessary stopovers for survival. 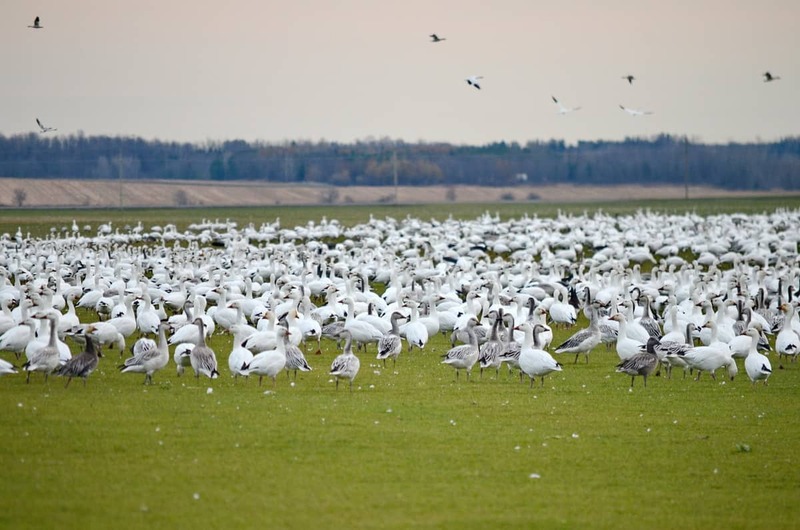 In fact, because Snow Geese avail themselves of leftover grain in farmers’ fields during the winter months, their numbers have increased dramatically since the 1960s, before which time they were in decline. 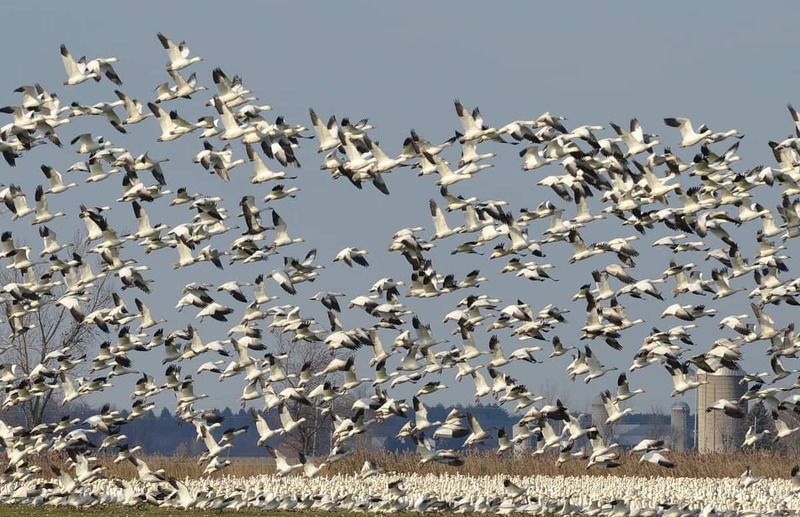 Improved farming techniques over the last few decades have resulted in a better food supply all along the migration route of the Snow Geese, so their population has skyrocketed from 2 million to 15 million. 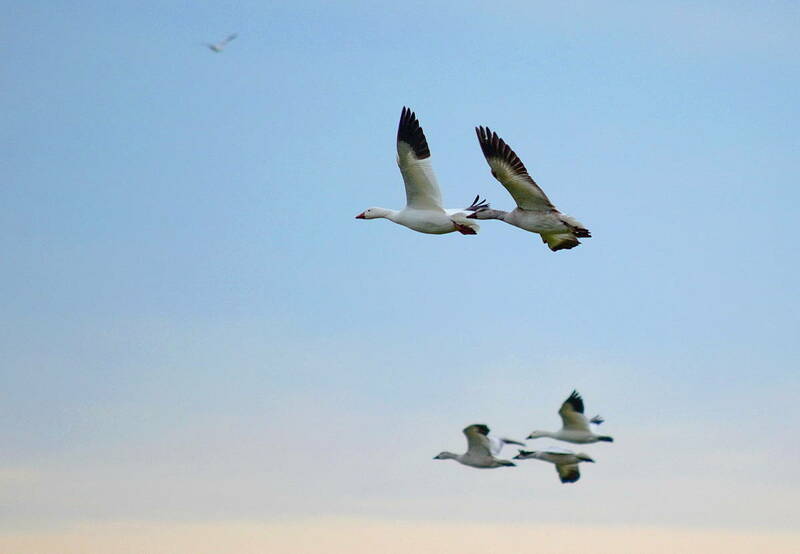 When the airborne flock of Snow Geese thinned out a bit, we were given lovely ventral views of the birds. 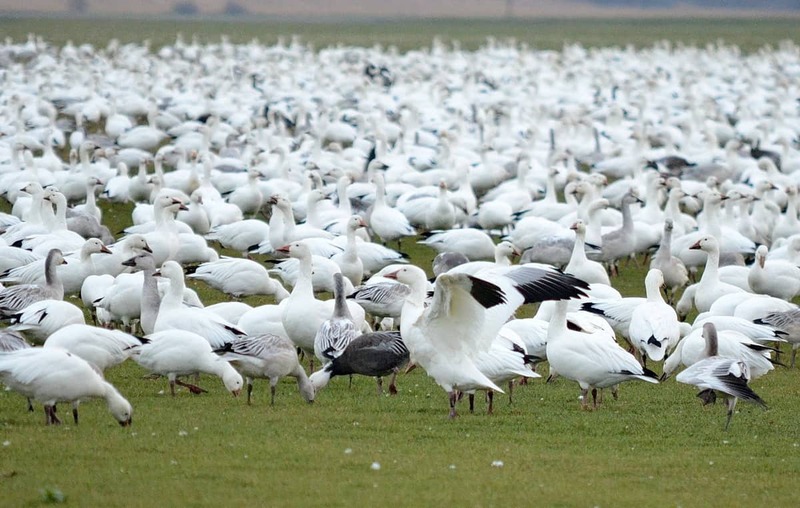 There are two colour morphs of the Snow Goose, white and blue. Seen from below, a white morph shows a white body and black-tipped wings. 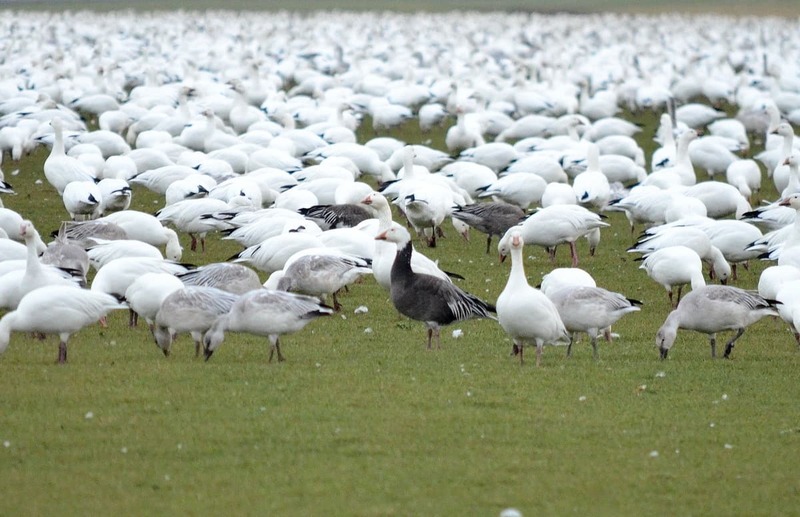 The darker coloured Snow Goose is a blue morph, but it’s difficult to say if it was an adult or immature individual. A little closer flyby enabled us to further appreciate the bright white plumage of the white morph Snow Geese blessed as we were with occasional bursts of sunshine. Soon after, the sky clouded in so we decided to seek access to the rear part of the field. A couple of vehicles had already been spotted driving along the northern perimeter. Less than 5 minutes later, we pulled up adjacent to the grounded flock of Snow Geese and were thrilled at our proximity to them…less than 100 feet. At that close range, it was possible to discern several blue morph Snow Geese with their grey plumage. whereas white morph juveniles are primarily dusky grey with more bright white showing as they molt into adult plumage. Blue morph Snow Geese, or Blue Geese, are rare among Greater Snow Geese, so we were pleased to find quite a few in this large flock. As Bob and I strolled the gravel shoulder, all was quiet while the Greater Snow Geese were busy foraging. At the sod farm where they had chosen to pass the time, the Geese were nibbling the ample supply of short grass. Greater Snow Geese are vegetarians that consume not only the leaves but also the roots and tubers of plants. 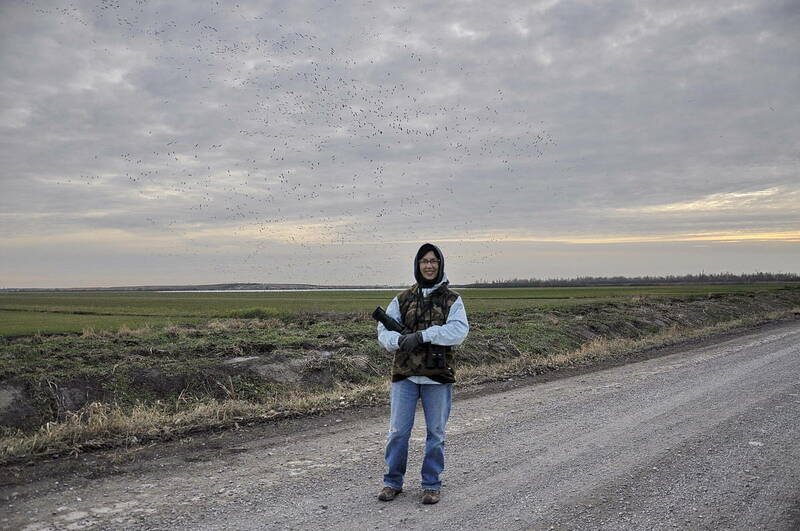 Perhaps that is why the farmer had coyote decoys staked in the southern part of the field. Both white and blue phase Greater Snow Geese have rose-red feet and legs, and a pink bill with black edges, but sometimes a Snow Goose will have discoloured plumage about its head due to the minerals in the soil where it is feeding. 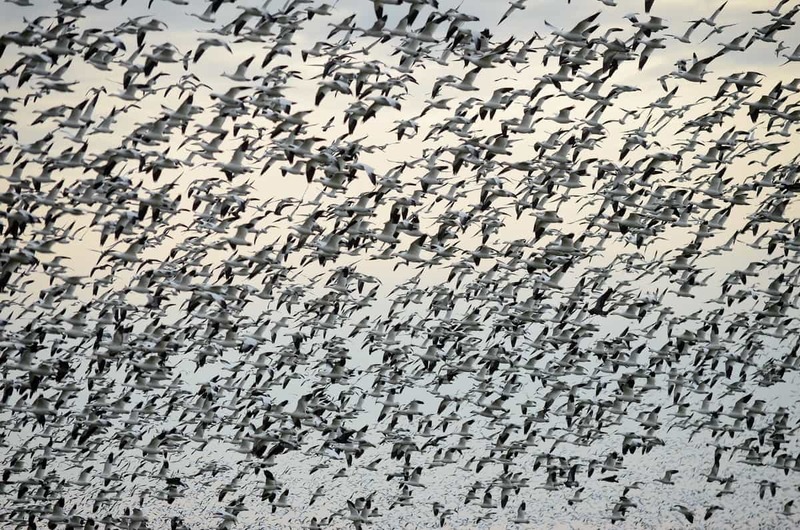 Greater Snow Geese don’t like to travel alone and prefer at least a couple of dozen birds with which to fly. 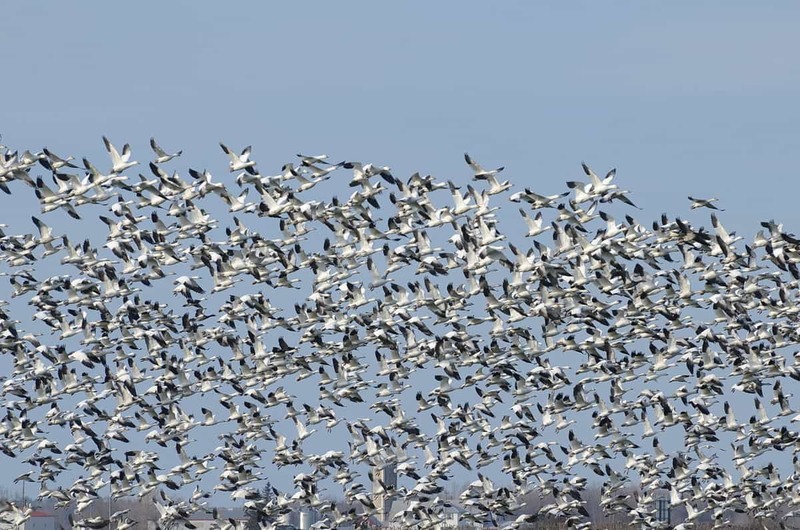 They customarily forage together in flocks when migrating and on their wintering grounds. We noticed that a great many of the birds were making for one of the nearby trenches. Our movement east and west along the road had no effect on the Snow Geese, so we sauntered over to see what they were doing. It appeared that the Geese were clambering over one another in an attempt to get a drink of water. 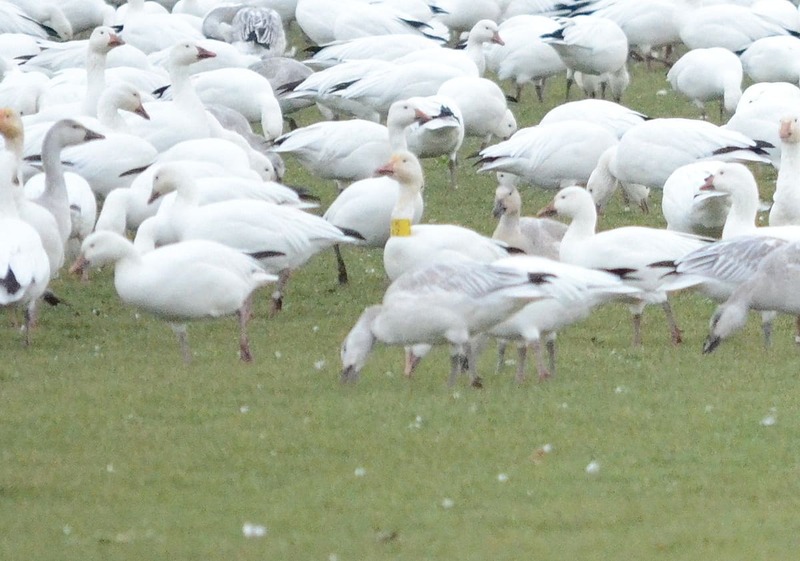 That is when we noticed that one Greater Snow Goose had a yellow band on its neck. We reached out to fellow birders more knowledgeable than ourselves and learned that this is a female Greater Snow Goose that would have been banded by the University of Laval on Bylot Island north of Baffin Island in Canada’s Arctic. In the Arctic, Greater Snow Geese have active predators such as Arctic Foxes and a group of seabirds called Skua that will raid nests for the goslings and eggs. 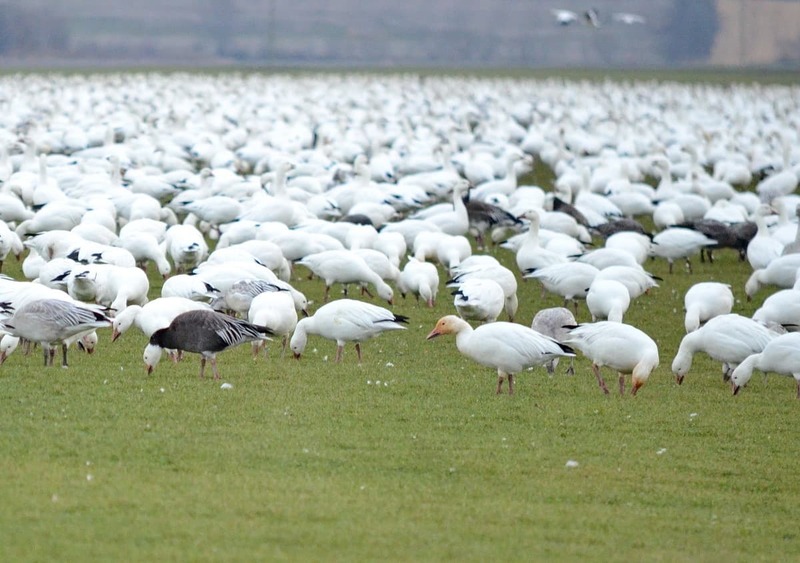 During non-breeding season, Snow Geese are seldom bothered by predators other than the occasional raptor. 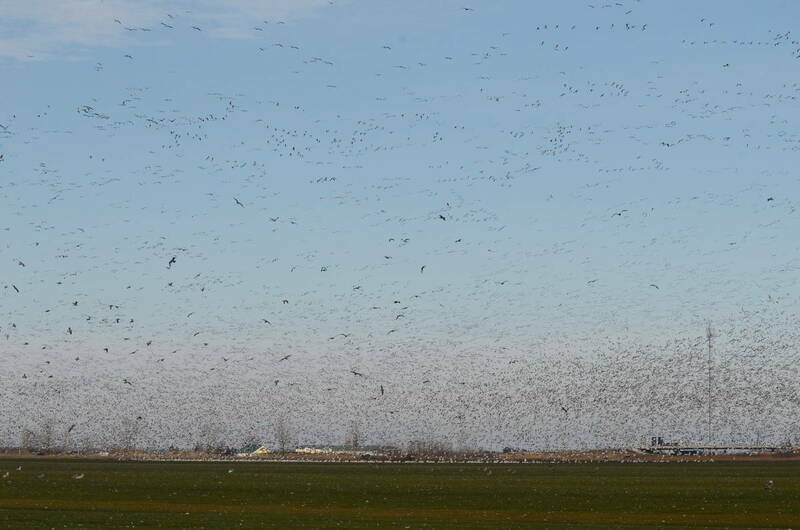 It wasn’t a raptor that sent these Snow Geese into a flurry. A low-flying aircraft came through and caused the flock to take to their wings. 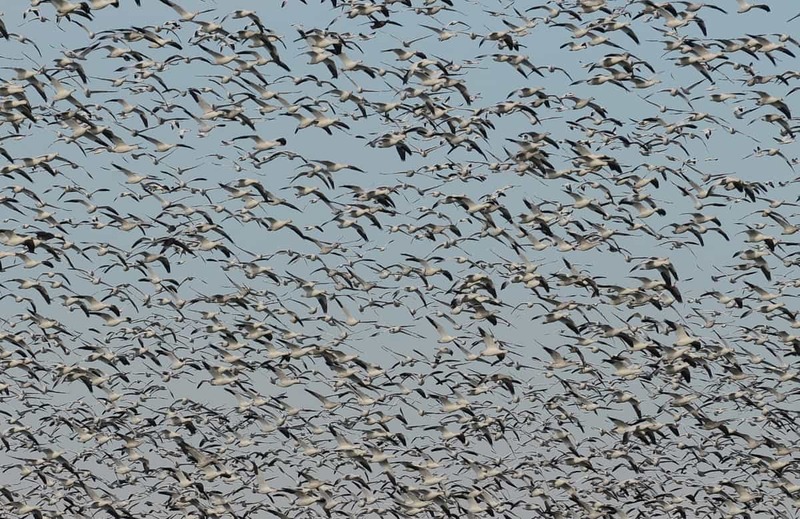 How thrilling to hear the cacophony of 60,000 Snow Geese vocalizing mixed with the throbbing sound of 120,000 wings beating the air. The sight of this whirling mass of birds performing seemingly acrobatic maneuvers as they swooped across the sky was awe-inspiring. 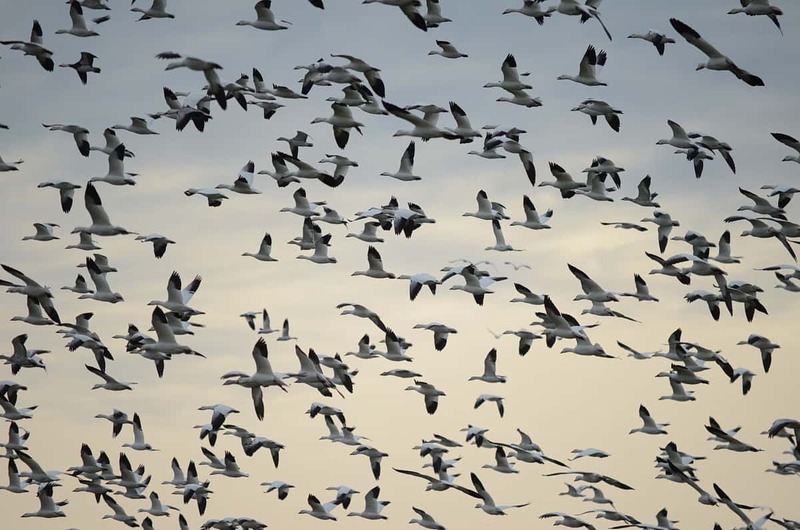 It is unbelievable that the confusion does not result in in-air collisions, but the flock is a fine-tuned horde of individuals each acutely aware of the other. Craning our necks backwards to take in the whole display was akin to standing inside a snow globe. And the honking was deafening! 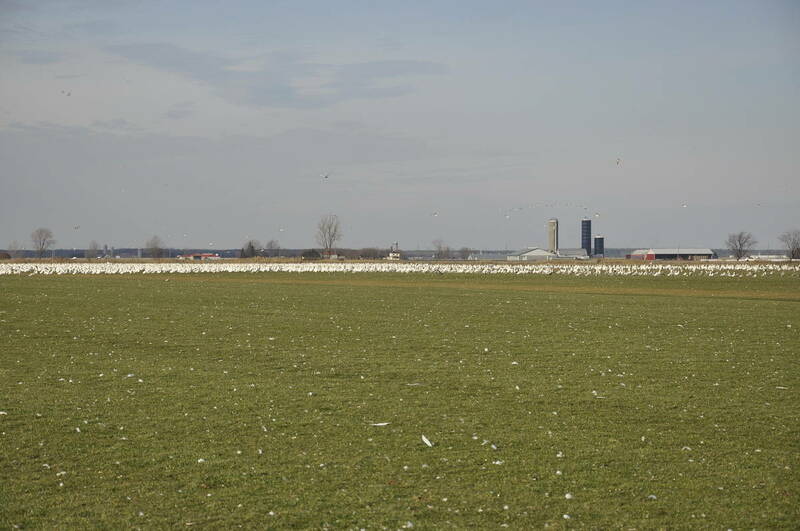 When the Greater Snow Geese suddenly decided to settle back down onto the field, pockets of white birds drifted down from the sky like falling snow. The Greater Snow Geese covered the ground once again in a snowy blanket of white. When the area got socked in by thickening cloud cover and dwindling daylight hours, it was time for Bob and me to hop back inside the car and ready for our 4 1/2 hour drive home. 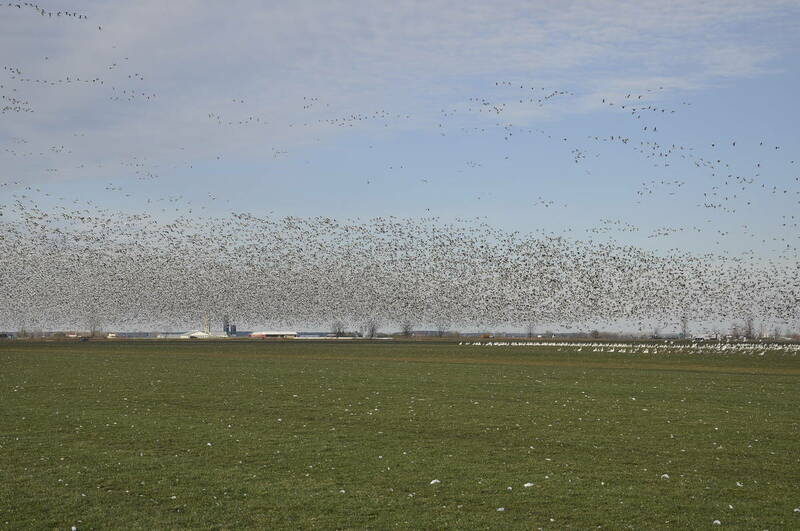 Even as we prepared to leave, Greater Snow Geese arriving from the north could be heard from a mile away. 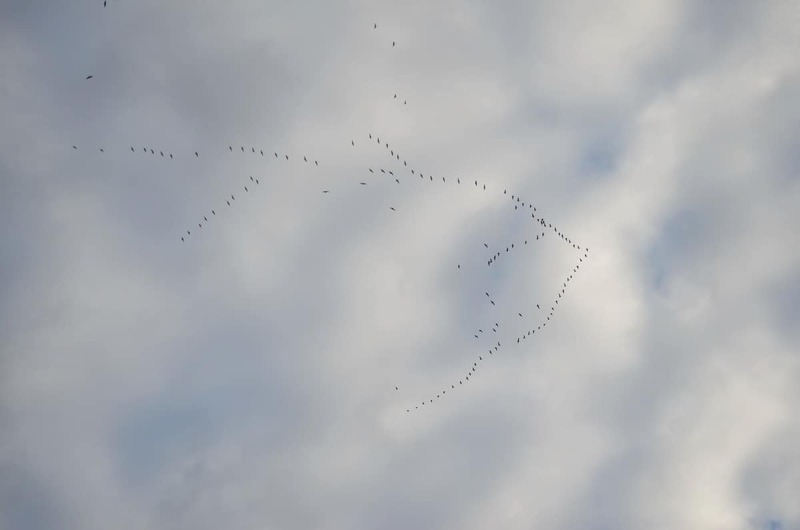 Often seen in loose formations, the flocks resembled ancient script etched on pale parchment as old as the annual migration itself. It had been a very worthwhile and eye-opening excursion. For the first time in my entire life. I,m sitting in my back yard at 830ish am. It’s a very quiet Sunday morning as usual. Something catches my attention. I hear a loud noise in the distance , like a wind mill on fast speed. I thought a plane ? It sounds very low to the ground .it was getting closer and louder. I’m like what is that noise above me come closer and closer. That was basically my thoughts in a matter of what was only less then a minute. I looked into the sky and just as I do I see a group of (I never before seen this in my life) . I could hear canadain guess , I know their sound all so well. But as I looked up , To my amazement it was something I never seen before ,Ever. Its March 23 2019. st catharines, ontario. White Geese!!! What an awesome observation! Thank you for sharing that with us. Nice! Thanks for letting us know. Nice, it’s always an amazing site when they decide to take off–just don’t look up. 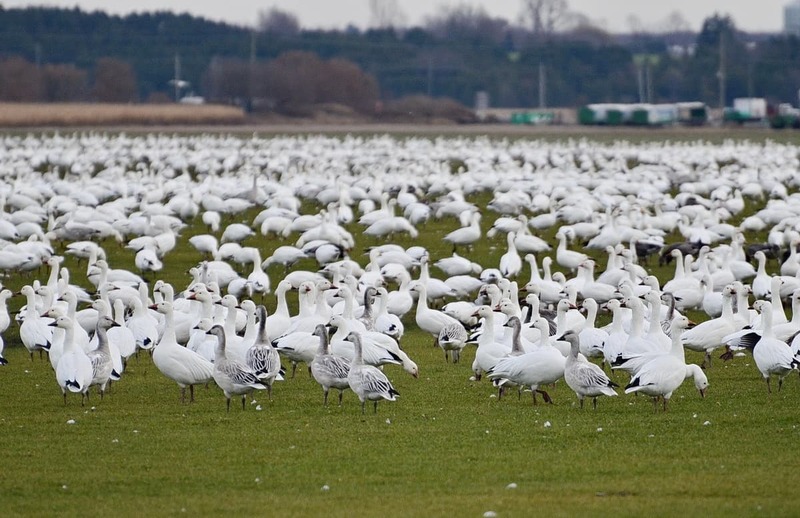 There’s a similar snow geese bird path in Delta, BC. called The George C. Reifel Migratory Bird Sanctuary. The Duke of Edinburgh stopped in there frequently. Hi John. Thank you for taking the time to contact us. If you care to take a look at our photos from Reifel Bird Sanctuary, please revisit our blog site. 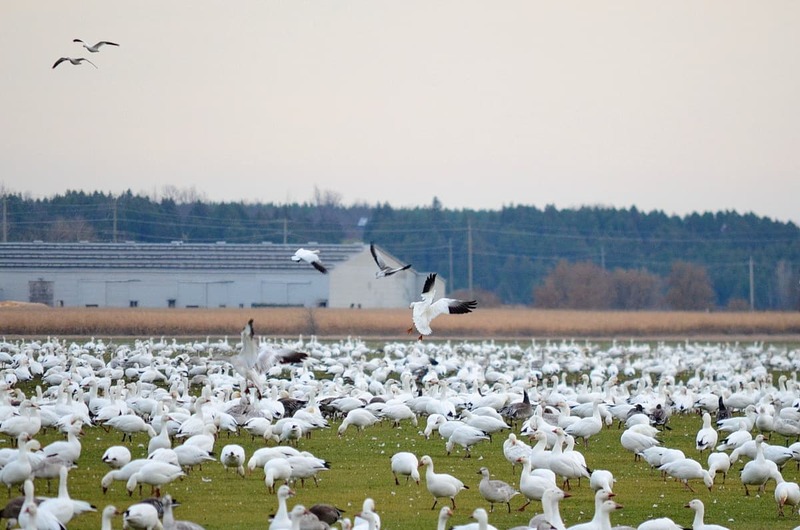 There is also a link to the Lesser Snow Geese that we saw at Reifel at the bottom of our blog about the Greater Snow Geese migrating through Ontario. Reifel Bird Sanctuary is an amazing place!